Car batteries seem to pick the coldest, wettest and dreariest days to decide they’re going to die, leaving you stranded either on the side of the road, or at home unable to get to work. While roadside assistance is a valuable resource, it can take them hours to arrive and get you back up and running again. The makers of the CTEK Multi US 7002 12 Volt Battery Charger understand that you don’t have time to wait around. That’s why they designed this unit for both ease of use and for compactness. No matter what type of weather you’re encountering, this unit can charge your battery so you can be on your way. It is also suitable for all of your recreational vehicle needs, such as boats, ATVs, cars – almost any 12 volt vehicle. It can be connected for months at a time, making it ideal for seasonal vehicles. Normal: For most gel batteries and maintenance-free batteries. Cold Weather: This is recommended in colder climates, where temperatures exceed 41 degrees Fahrenheit. Supply: This is a maintenance mode that gives a constant supply of 13.6 volts. Recond: This is used to recondition severely discharged batteries. 1) Desulphation: This allows the battery to be reconditioned in the event that it has lost power due to non-use. 2) Soft Start: This step charges the battery until the terminal voltage has reached a pre-set level. 3) Bulk: This is where the battery gets charged to about 80%. 4) Absorption: The final charging stage; the voltage is maintained at a pre-set level. 5) Analysis: The voltage is measured and the charging is suspended. 6) Recondition: A constant current of 1.5 A is fed to the battery, with a maximum voltage of 15.7 volts. 7) Float: The constant amount of voltage is maintained. 8) Pulse/Maintenance Charging: A pulse of electricity is injected into the battery if it dips below 95% voltage. This keeps the battery in ideal condition even when it’s not in use. The CTEK Multi US 7002 has been designed with safety in mind. They are spark-free, which makes the connection much safer. It also protects against reverse-polarity connections. They are also short-circuit proof. There is a red light indicator, which tells the user that it has not been connected properly, and charging has not started. The unit weighs in at 2 pounds, with dimensions of 10” x 2.8” x 7,” (length, width, height.) This makes for a lightweight, yet powerful tool. Accessories include the Comfort Connect Cig Plug, which allows a charge through the cigarette lighter of a vehicle. Another popular item is the Comfort Indicator Panel, which shows the status of a vehicle’s battery and is designed for easy maintenance. The unit comes with a 5-year limited warranty from the manufacturer, which should give the consumer peace of mind knowing that their equipment is protected. The warranty protects against defects in workmanship and materials. It is non-transferable and applies to the original owner only. The multiple modes allow for charging in all kinds of weather, be it snow, sleet, hail, or rain. Cold temperatures are no match for the CTEK Multi US 7002. The constant charge for months at a time make it ideal for charging seasonal vehicles. The 8-step charging cycle makes it a superior choice for charging any kind of vehicle, as well as keeping your battery in perfect condition, even when it is not being used. The safety measures ensure that users are protected. They are spark-free, and short-circuit proof. The unit will not charge the battery if it is not connected properly, and will indicate such to the user, via a red light. It is small and compact, making it easy to store and transport. It does not have the ability to jump start batteries, only charge them. According to the manual, it cannot charge deep-cell batteries. It is small and compact, making it a bit less durable than other, larger models. 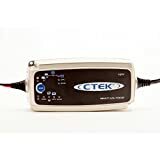 According to several review sites including Amazon and Overstock.com, consumers are giving this CTEK Multi US 7002 excellent ratings and reviews. Consumers appreciate the fact that the unit is light and compact; they also love that it can charge recreational vehicles. The biggest benefit seems to be the ability of the charger to work in any weather conditions, and at extreme temperatures. The one small complaint that some consumers had was that the rate of charging was a bit slower than larger models; but this is to be expected when you have a compact charger. At the time of the review, the CTEK Multi US 7002 is available within the price range of $107 – $139. The CTEK Multi US 7002 offers many benefits to the user, including multi-modes, 8-step charging and constant charging ability. All in all, it offers great value and is reasonably priced. It is lightweight and compact, and with the cigarette lighter accessory, you won’t even need to open your car’s hood in order to charge the battery. This makes it easy to use and safe for both the vehicle and the user.